I’m always delighted by witnessing a sweet, nice thing that a person has done for someone else. It lifts my spirits. I try to write it down, not only so I can remember it, but also feeling that recording the thoughts will amplify and preserve the energy embedded in that act of kindness. So here’s a story for you. I have a nephew, Ben, a young family man in his 30’s who is devoted to his great-grandparents, my mother and father. Mom, now 95 years old, has fallen at home and not been able to get herself up again. Dad, now 99 years old, is unable to lift her, but can hand her the telephone. She calls Ben. Over Ben comes and helps the old folks. Then he leaves little sticky-notes with his telephone number at eye-level to anyone on the floor. 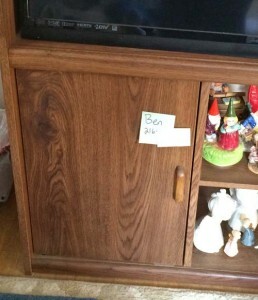 So there is a sticky-note near the TV and another sticky-note in the bedroom. They are unbelievably cute. It touches my heart. P.S. I have covered Ben’s number when I took the picture. I think he would be embarrassed if any of you actually called him.